An introverted consciousness can be well aware of external conditions, but is not motivated by them. The extreme introvert responds primarily to internal impressions. Signs of introversion in a child are a reflective, thoughtful manner and resistance to outside influences. The introverted attitude tends to devalue things and other persons, to deny their importance. 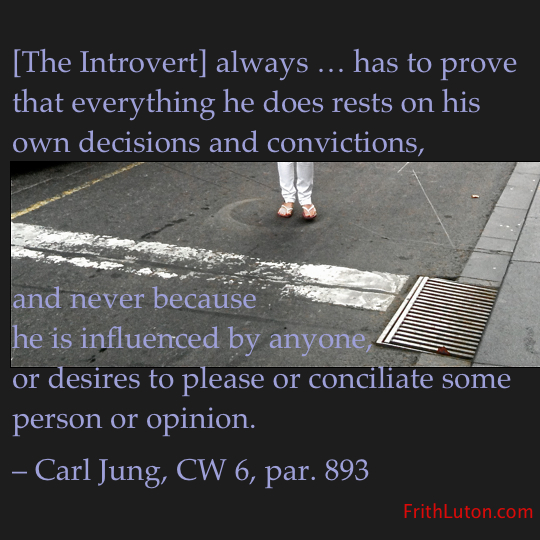 Hence, by way of compensation, extreme introversion leads to an unconscious reinforcement of the object’s influence. This makes itself felt as a tie, with concomitant emotional reactions, to outer circumstances or another person. A person in this situation can be worn out from fruitless attempts to impose his or her will. In less extreme cases, introverts are simply more conservative than not, preferring the familiar surroundings of home and intimate times with a few close friends; they husband their energy and would rather stay put than go from place to place. Their best work is done on their own resources, on their own initiative and in their own way.